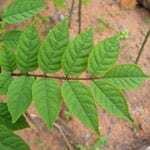 The leaf of the ash helps to improve the soil. They fall when they are still green and rot with help from many different kinds of creatures on the ground. All the nutrients in the leaves are transformed quickly into humus. 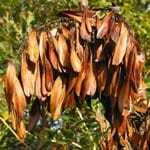 Consequently, the soil underneath the ash tree has a good structure, retains moisture well, contains plenty of air and supports a wide range of soil-living animals. 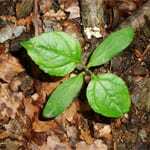 The leaf has 9-13 leaflets with long tips. Each leaflet is toothed and is borne opposite another, with one leaflet at the end. The leaves react to light and can direct the leaflets so that they catch the most light from the sun. Sometimes the whole crown of the tree will push to the right or left for this reason. The leaves fall when they are still green, because the tree doesn’t need the stored nitrogen in them. 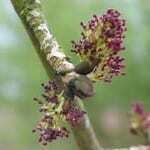 The first flowers of the ash are borne when the tree is about 30 years old. The flowers appear in bunches before the shoots and leaves in April and May. They are a deep purple in colour. The scent of the flowers attracts night-flying insects, which are an important source of food for bats. The fruits ripen through September and are ready for dispersal in October, when they turn from green to brown. They hang in clusters (like bunches of keys). Each fruit is about 3cm long – the actual seed is half of this length, the rest being a wing to aid dispersal. 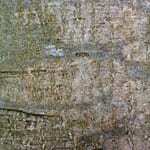 The young tree has greyish bark, which is smooth (see picture). As the tree becomes older, the bark becomes grey/brown and creased. Ash is one of our tallest native trees and can reach 40m in height in good conditions. It can live to over 200 or 300 years. Ash grows very quickly in good, rich soil. 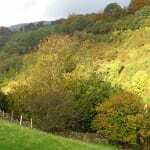 It will grow well near river banks and in wet woodlands, but forms proper woodland only on well-drained soil. Ash is now the most common tree in Northern Ireland, having found plenty of suitable habitat in the years following the changes made to woodlands after humans began to settle the land and fell trees (about 6000 years ago). Prior to this, ash would have made up a much smaller proportion of our woods.